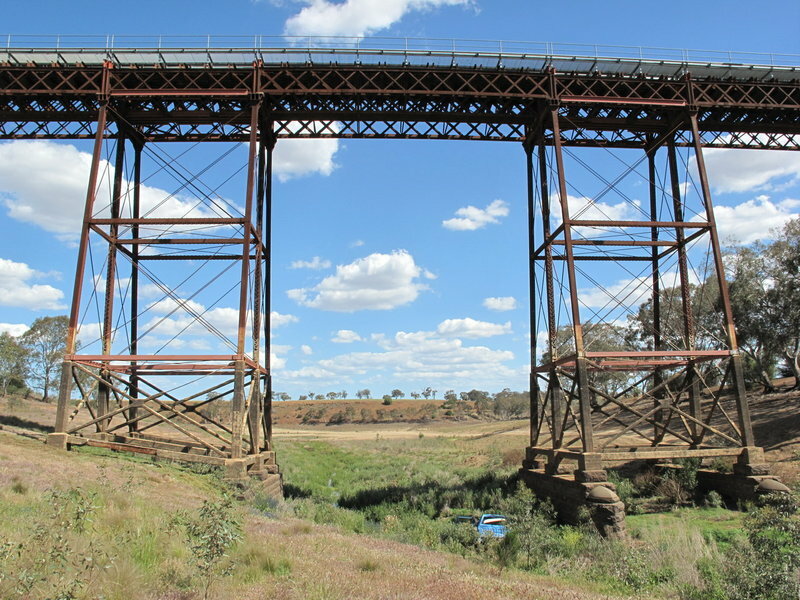 The Melton Viaduct, built for Victorian Railways in 1886, is a wrought iron lattice girder and trestle rail bridge crossing the Werribee River (now Melton Reservoir) near Melton. 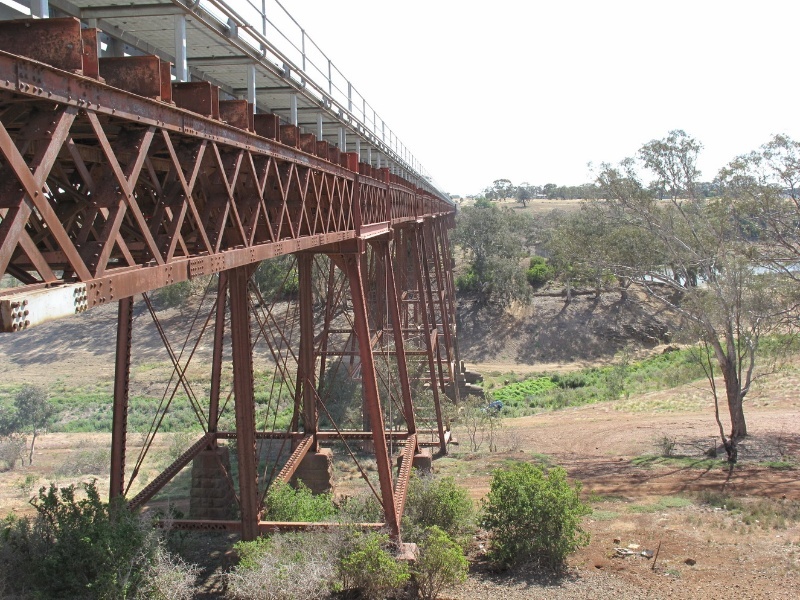 The viaduct was built as part of the Melton-Parwan section of the direct line from Melbourne to Ballarat. The previous rail route to Ballarat, via Geelong, had opened in 1862. The direct link to Melbourne reflected Ballarat's growing economy as well as the commercial and political influence of the city and provided a more direct rail link between Melbourne and Western Victoria. 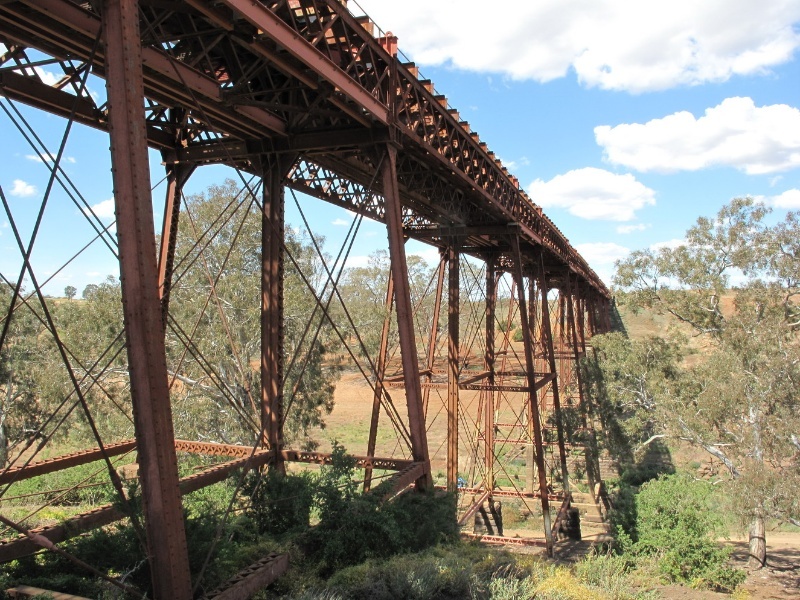 The bridge shows the influence of lightweight railway design developed in North America in the mid to late nineteenth century which reflected a change in the approach of Victorian Railways to railway construction following the extravagant early railway boom of the 1860s. The use of incremental construction with travelling cranes, prefabrication of components, and use of tensioning rods for stability and simplification of construction, were also indicative of these changes in railway construction. 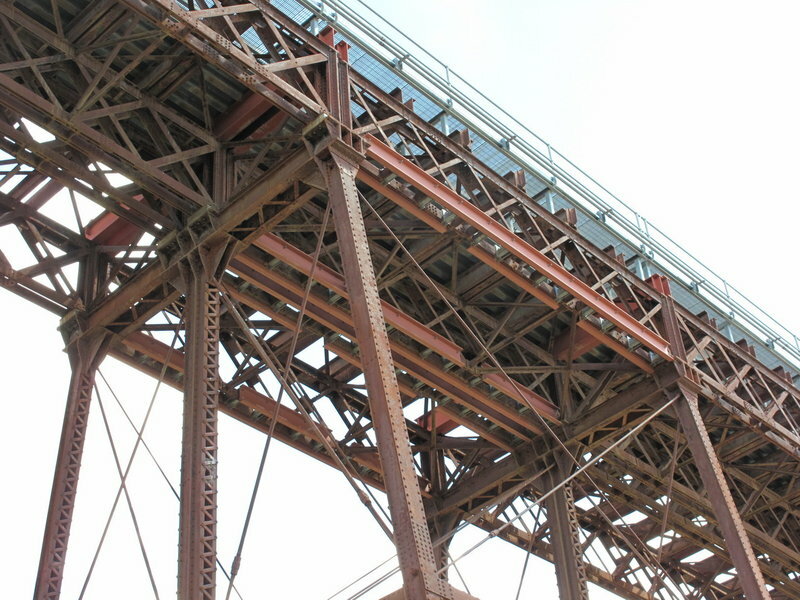 Despite several alterations to its deck structure, the bridge remains an outstanding example of a lighter structural design employing open metal trestle supports and metal truss girders. 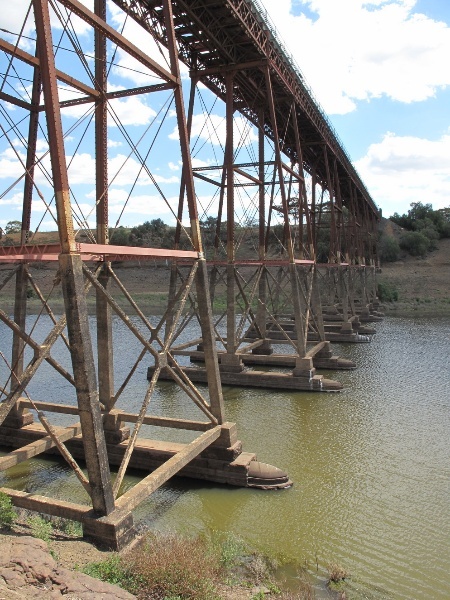 Standing 38 metres over the Werribee River, the 375 metre long bridge is constructed of double lattice trusses supported on square tapering trestles constructed of trussed wrought iron legs. The bridge has bluestone abutments and pier bases of coursed rock-faced bluestone with drafted margins. 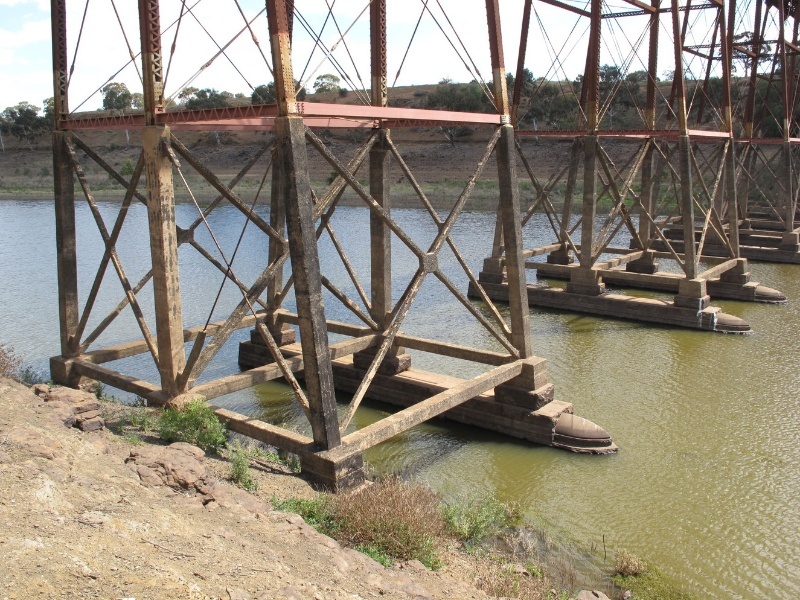 The larger piers, now sometimes submerged in the Melton Reservoir, have sharp tapered cutwaters with curved coping at their tops. This site is part of the traditional lands of the Wathaurung and Wurundjeri people. Criterion G Strong or special association with a particular community or cultural group for social, cultural or spiritual reasons. This includes the significance of a place to Indigenous peoples as part of their continuing and developing cultural traditions. 1. All of the structure marked B1 on Diagram 2327 held by the Executive Director. 2. 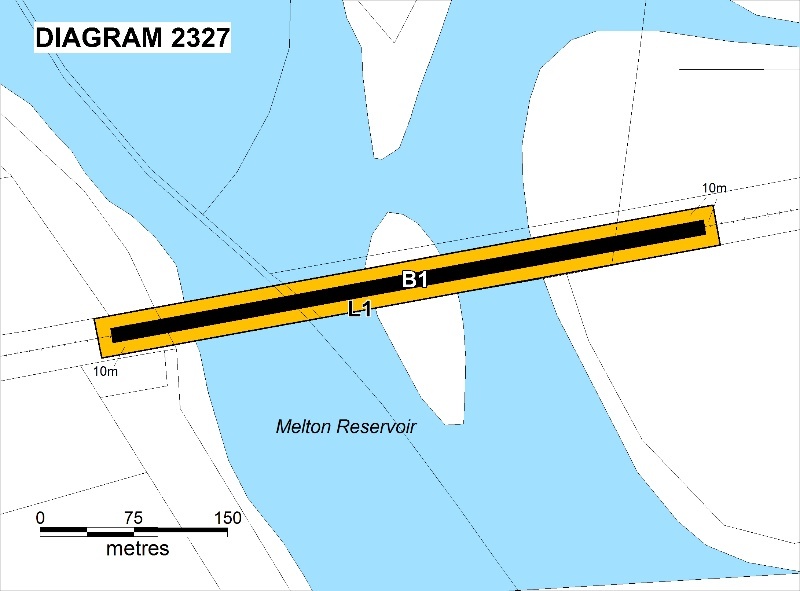 All of the land marked L1 on Diagram 2327 held by the Executive Director being a 10 metre curtilage from the bridge and being part of Lot 1 on Title Plan 547376, part of Crown Allotment 2002 Parish of Mooradoranook, part of Crown Allotment B Section 23 Parish of Mooradoranook, part of Crown Allotment 2013 Parish of Djerriwarrh, and part of Crown Allotments A, B, 1 and 2 Section 3 Parish of Djerriwarrh. The History was taken from The National Trust of Australia (Victoria) Draft Classification Report, by Gary Vines, Biosis Research Pty Ltd, 27/05/2009. The Melbourne to Ballarat track was one of the earliest overland routes in the Port Phillip Colony, although initial traffic to the lush Western District was via Geelong. A similar history of railway transport also occurred, with the initial railway connection to Ballarat from Melbourne going via Geelong, due to the existence of the privately financed Melbourne and Geelong Railway, which was completed in 1857. 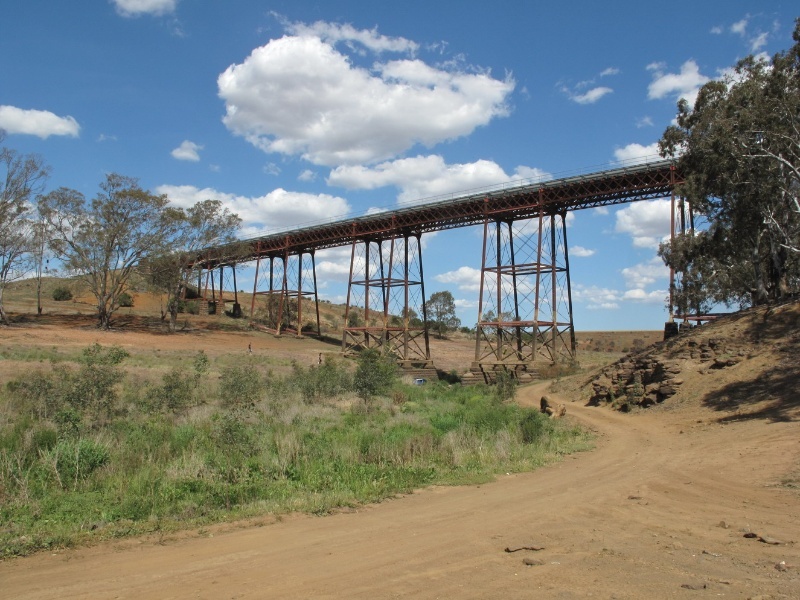 When the first Government railways were constructed, the goldfields of Ballarat and Bendigo were priority routes. The slightly shorter distance from Geelong (86km as opposed to 106km from Melbourne), slightly easier grades, and the successful lobbying of Geelong interests saw the Geelong Ballarat Route opened in 1862. Subsequently the Ballarat route was seen as the means for opening up the Western District, so that the line was extended to Beaufort in 1874, Ararat in 1875, Stawell in 1876 and to Hamilton and Portland in 1877. 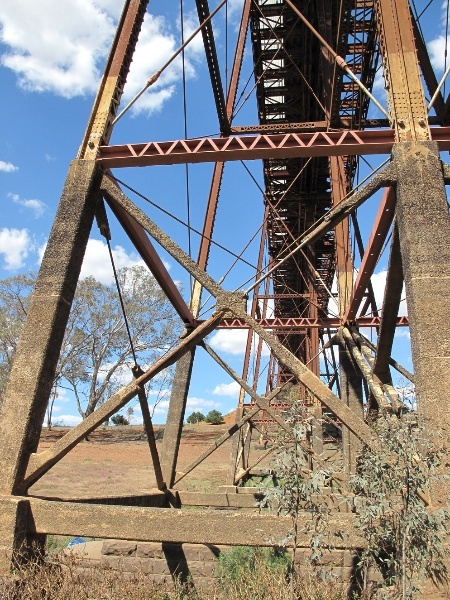 The 1870s and 80s saw numerous branch railways extended into the north west and west, with lines reaching Camperdown, Donald, Wycheproof, Boort, Mitiamo, Numurkah and St James. These provided the basis for even more extensions under the 1884 "Octopus Act" and later, as rails reached every corner of the state. Construction of a direct route from Melbourne to Ballarat was considered in earlier railway planning, but this was probably only part of the justification for the route, as the Octopus Act can be seen as part of a more general railway mania which saw railways as a form of political patronage and an obsession for filling in the gaps in the network. By the 1880s the western line from Ballarat was pushing west towards the South Australian Border. At the same time small extensions were being made east from Ballarat and westward from Melbourne. In 1879 the Warrenheip to Gordon line was opened, branching off the main line about 5km east of Ballarat. It was extended to Ballan in 1886. The Braybrook Junction (later known as Sunshine) to Melton line was laid as the first stage in the direct route to Ballarat linking the growing industrial suburb. 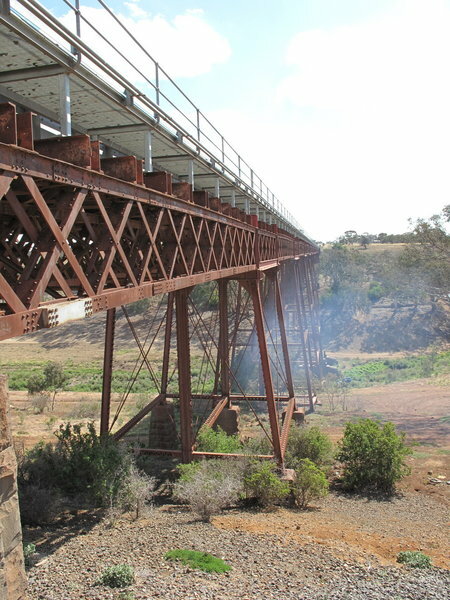 After wooden bridges were built over the Kororoit and Toolern Creeks, the railway reached Melton, and was officially opened on 2 April 1884. Dignitaries attending the celebratory banquet at the Shire Hall included Premier Duncan Gillies, Minister for Railways Alfred Deakin, Chief Secretary and Solicitor General who represented West Bourke (now Bulla), Mr James Balfour, and MLC for Southern Province and Sir William Clarke MLC. 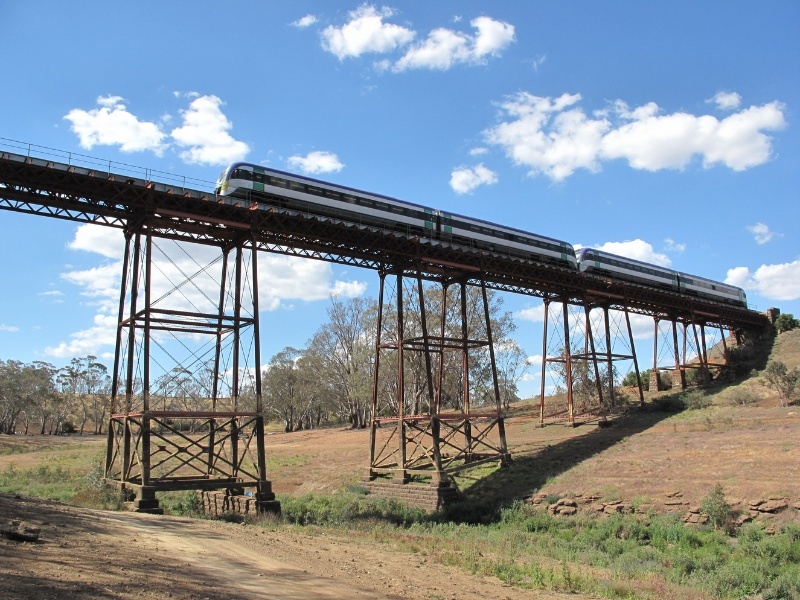 The completion of the final stage of the Ararat to Serviceton railway in 1887 had completed the Adelaide-Melbourne-Sydney rail connection. However all this traffic still went by way of Geelong until the direct route from Melbourne to Ballarat was completed in 1889. 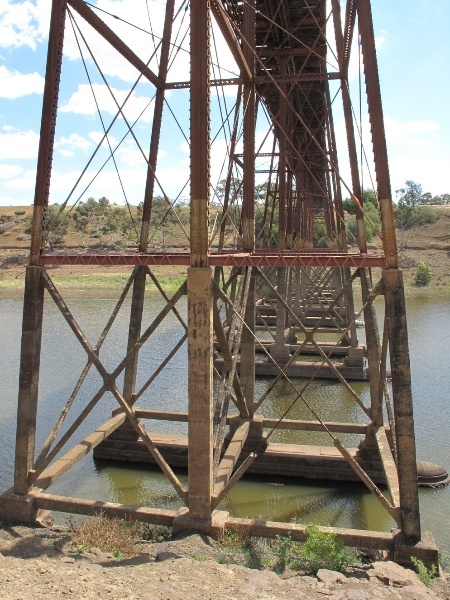 The opening of the first stage of the direct route, first to Melton in 1884, was followed by the extension to Parwan in 1886, Bacchus Marsh in 1887, and finally to Ballan in 1889 to link up with the existing branch through Gordon and Warrenheip. This line included the Melton Viaduct which employed a sophisticated cantilevered construction system. Originally known as the Braybrook Junction (Sunshine) to Warrenheip (Ballarat) railway, this route was first proposed in 1855, the first sections of track were built in the late 1870s as part of the Gordon branch line, and the whole connection was completed in the late 1880s. With the railway, a series of improvements were made to the local area and considerable commercial activity eventuated. A Mr W Blackwood constructed the goods shed and platform at Melton station. A series of chaff mills were established in the district from the 1890s, generally served by sidings near the stations and small settlements at Rockbank, Melton, Parwan, and Bacchus Marsh. The line itself also provided Ballarat Manufacturers such as HV McKay, with a more direct (and with differential freight rates) cheaper transportation to the Melbourne forwarding yards and ports for overseas shipment. The line was therefore quickly integrated into the Colony's (and from 1901 the state and national) trade system. The railway had been optimistically awaited. The Victorian Municipal Directory kept predicting that the ".completion of the railway line to Ballarat making the direct line to Adelaide will cause a prosperous township to spring up at the railway station." The impact of the railway was immediate, but mixed. The railway facilitated some existing industries: "The opening of the railway made the town busier, with quite a good trade being done in firewood. It was not long before two saw mills were in operation, and some milk traffic was developing." And for a few years the town benefited as the terminus for the Ballarat coaches. But once the railway was opened through to Ballarat, coaches, bullock wagons and horse-drawn vehicles were relegated to local transport and through traffic all but disappeared along the Ballarat road until the coming of the automobile several decades later. The Melton Viaduct followed a design evolution that could be traced back to British precedents such as the first practical applications of James Warren and Willoughby Monzani's patents such as the Newark Dyke Bridge (Nottinghamshire UK) of 1852 and the Crumlin Viaduct in Wales of 1857. 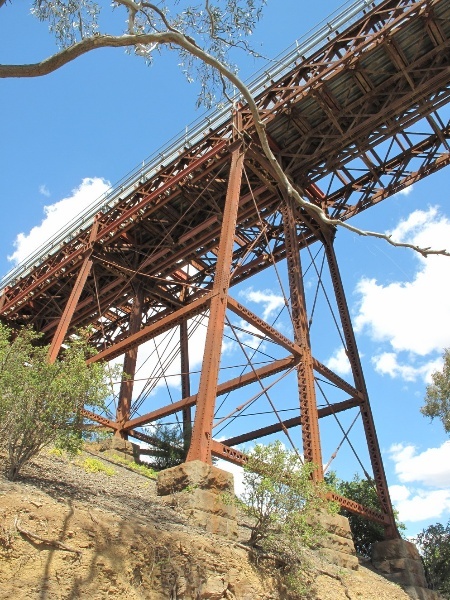 However, the combination of the truss and trestle forms, and their adaptation from timber to iron and then steel, was brought to fruition in America, where railway construction expanded in the late nineteenth century, compared to its gradual slowing in Britain. 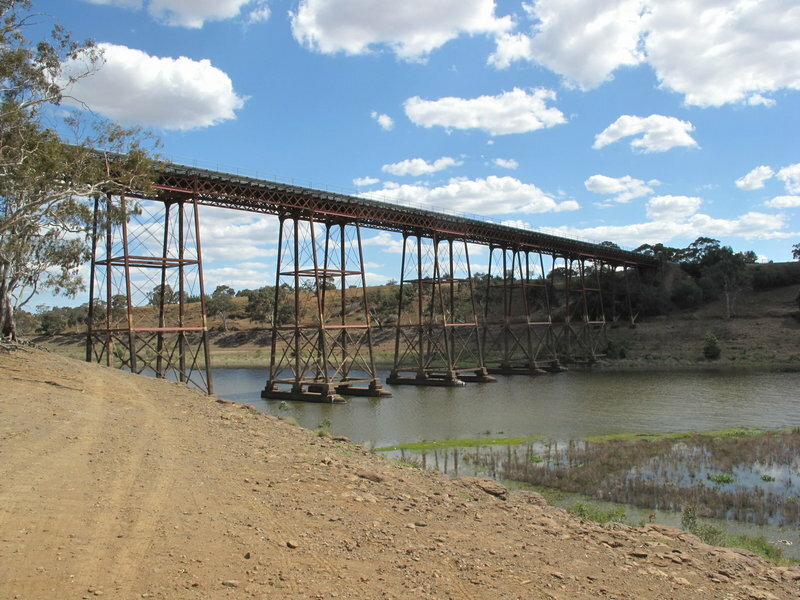 The bridge is a very long wrought iron lattice girder bridge supported on tension-braced wrought iron trestles. 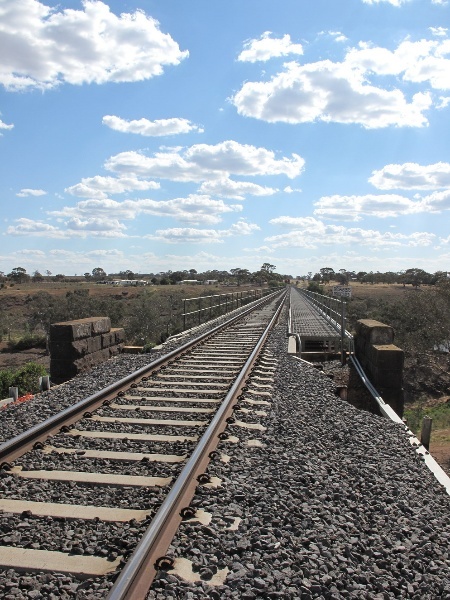 Its overall total length of 375 metres and 38 metre height over the Werribee River makes it the major construction on the line. 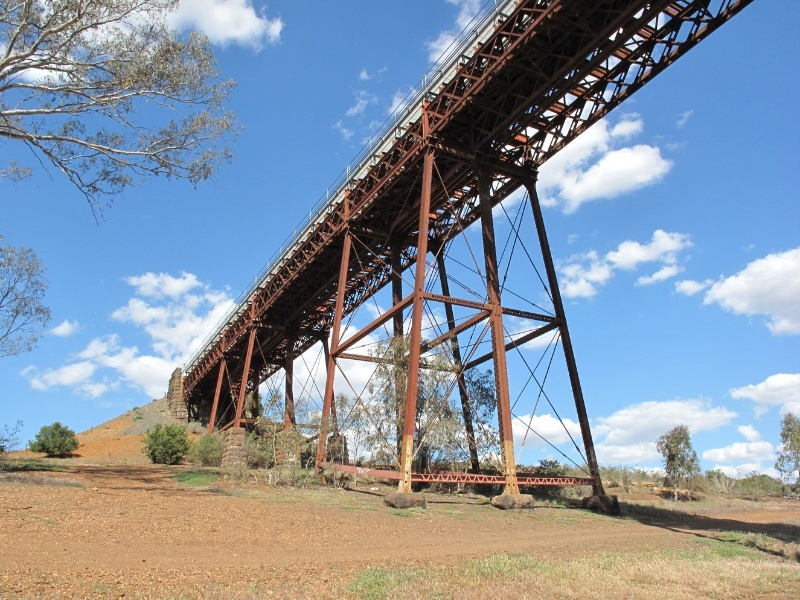 Its lattice girder construction is generally of alternate 18.3 and 9.1 metre spans, with the latter forming the top member of the slender metal frame trestles. Construction on site was facilitated by some prefabrication, with sections of truss and trestle frames pre-assembled and riveted. 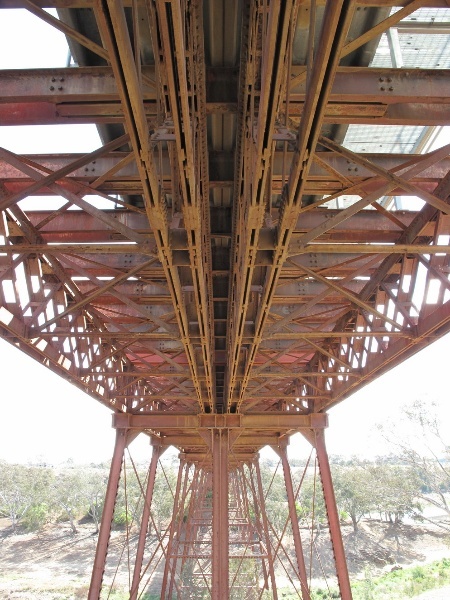 It is likely that this work was done by a Melbourne ironworks, as a number of local engineering works had developed the capacity to undertake large fabricating contracts, with some of the earliest locally made iron bridges being used on the North Eastern Line a decade before. Construction on site involved a large workers' camp for men engaged in the construction work. The construction itself is well documented in a number of photographs, showing the sequence and methods of construction. 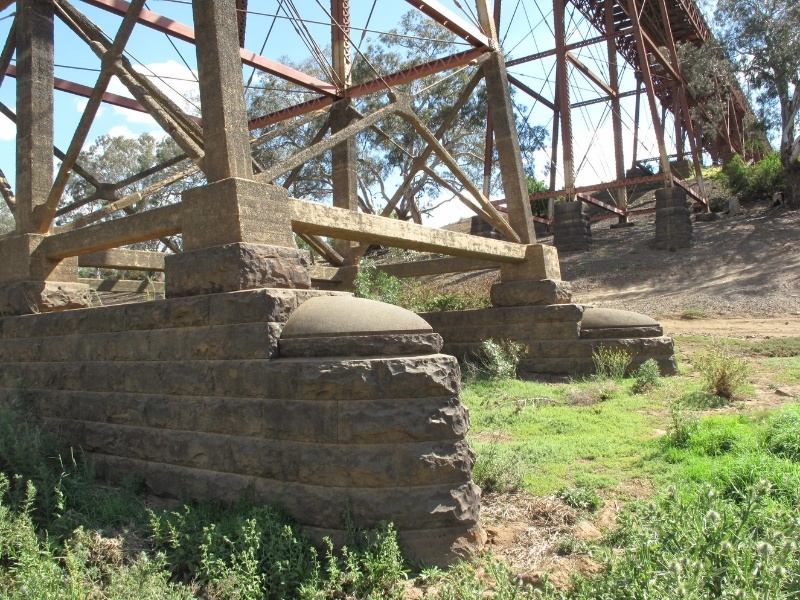 The bluestone abutments and piers were first built, and a staging for the erection of the first trestles was built from them. As the sections of truss were installed, the travelling crane ran out over temporary tracks to place each subsequent section of girder. Four girders or trusses were placed on each section, with field riveting being confined to the assembly joints. As each span was completed the travelling crane moved forward. 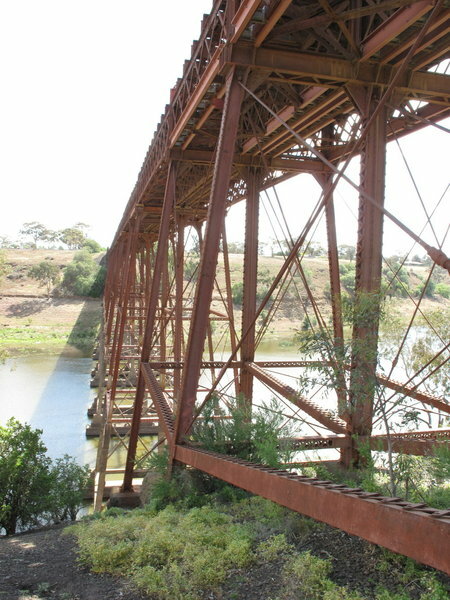 It would appear that the erection sequence was carried out from the east side, with the smaller trestles on the crossing of the small tributary creek built first, then the section over the rising ground between it and the main Werribee River channel, then the tallest part of the viaduct, before the steep western slope of the valley. Cross girders and angle iron posts for the side fences were then attached. 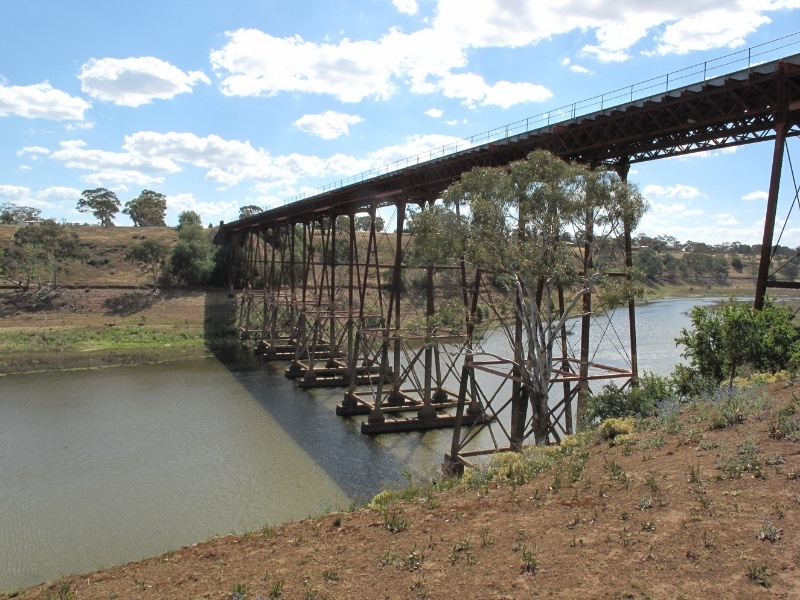 This bridge was opened in April 1886, as part of the Melton-Parwan section of the direct line from Melbourne to Ballarat. A local historian claimed "in those days was a remarkable construction". 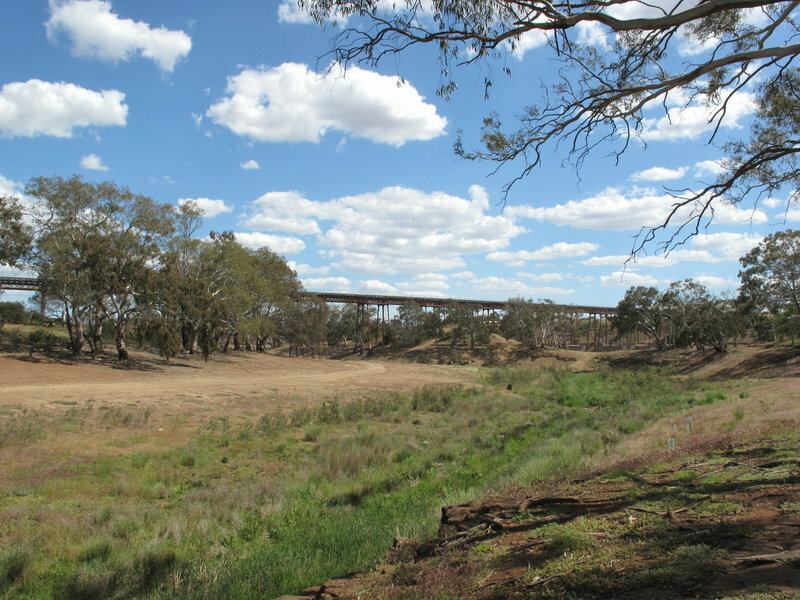 The Melton Viaduct was constructed for Victorian Railways in 1886 as part of a direct rail route from Melbourne to Ballarat and Western Victoria, replacing the previous rail route to Ballarat, via Geelong, and reflecting Ballarat's growing economy and political influence. General Conditions: 1. All exempted alterations are to be planned and carried out in a manner which prevents damage to the fabric of the registered place or object. General Conditions: 2. Should it become apparent during further inspection or the carrying out of works that original or previously hidden or inaccessible details of the place or object are revealed which relate to the significance of the place or object, then the exemption covering such works shall cease and Heritage Victoria shall be notified as soon as possible. Note: All archaeological places have the potential to contain significant sub-surface artefacts and other remains. In most cases it will be necessary to obtain approval from the Executive Director, Heritage Victoria before the undertaking any works that have a significant sub-surface component. General Conditions: 3. If there is a conservation policy and plan, all works shall be in accordance with it. Note: A Conservation Management Plan provides guidance for the management of the heritage values associated with the site. It may not be necessary to obtain a heritage permit for certain works specified in the management plan. General Conditions: 4. Nothing in this determination prevents the Executive Director from amending or rescinding all or any of the permit exemptions. General Conditions: 5. Nothing in this determination exempts owners or their agents from the responsibility to seek relevant planning or building permits from the responsible authorities where applicable. Public Safety and Security : The following public safety and security activities are permit exempt under section 66 of the Heritage Act 1995, a) public safety and security activities provided the works do not involve the removal or destruction of any significant above-ground structures or sub-surface archaeological artefacts or deposits; b) the erection of temporary security fencing, scaffolding, hoardings or surveillance systems to prevent unauthorised access or secure public safety which will not adversely affect significant fabric of the place including archaeological features; c) development including emergency stabilisation necessary to secure safety where a site feature has been irreparably damaged or destabilised and represents a safety risk to its users or the public. Note: Urgent or emergency site works are to be undertaken by an appropriately qualified specialist such as a structural engineer, or other heritage professional. Signage and Site Interpretation : The following Signage and Site Interpretation activities are permit exempt under section 66 of the Heritage Act 1995, a) signage and site interpretation activities provided the works do not involve the removal or destruction of any significant above-ground structures or sub-surface archaeological artefacts or deposits; b) the erection of non-illuminated signage for the purpose of ensuring public safety or to assist in the interpretation of the heritage significance of the place or object and which will not adversely affect significant fabric including landscape or archaeological features of the place or obstruct significant views of and from heritage values or items; c) signage and site interpretation products must be located and be of a suitable size so as not to obscure or damage significant fabric of the place; d) signage and site interpretation products must be able to be later removed without causing damage to the significant fabric of the place; Note: The development of signage and site interpretation products must be consistent in the use of format, text, logos, themes and other display materials. Note: Where possible, the signage and interpretation material should be consistent with other schemes developed on similar or associated sites. It may be necessary to consult with land managers and other stakeholders concerning existing schemes and strategies for signage and site interpretation. Minor Works : Note: Any Minor Works that in the opinion of the Executive Director will not adversely affect the heritage significance of the place may be exempt from the permit requirements of the Heritage Act. A person proposing to undertake minor works must submit a proposal to the Executive Director. If the Executive Director is satisfied that the proposed works will not adversely affect the heritage values of the site, the applicant may be exempted from the requirement to obtain a heritage permit. If an applicant is uncertain whether a heritage permit is required, it is recommended that the permits co-ordinator be contacted. The extent of registration protects the whole site. Works and alterations to the place, except those outlined in 'Permit Exemptions' may impact on the cultural heritage significance of the place, and require a permit. 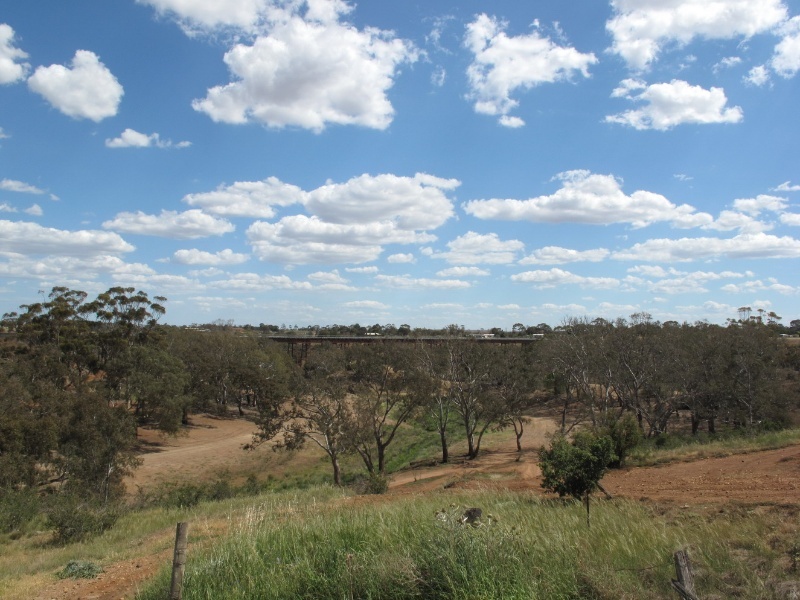 The purpose of this requirement is not to prevent any change on this site, but to enable control of possible adverse impacts on heritage significance during that process.